Trent has worked in concrete construction since 1997. He came to Hottmann in 2007 and has held foreman roles in walls and flatwork. He’s also been an operator of both belt and boom trucks. In 2012, he became a field supervisor, and in 2017 he became the production manager. Trent is an American Concrete Institute Certified Technician. 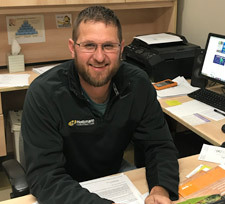 Outside of work, Trent coaches youth baseball, and in his spare time, you’ll likely find him enjoying the outdoors by hunting, fishing, or camping with family. He’s also been playing baseball with the Sauk Prairie Twins for more than 20 years.